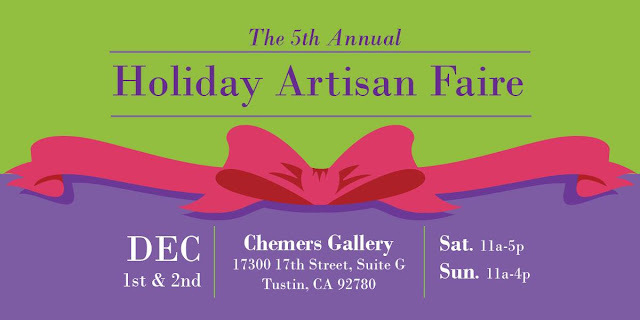 Hope to see you at the Chemers Gallery Holiday Artisan Faire At Enderle Center in Tustin, CA on Saturday 12/1 (my birthday) and/or Sunday,December 2 where I will showing my felted garments and accessories. This will be my third year showing at this high end gallery show and sale and it not only a pleasure but a privilege too. Below are just a few of the items that will be available at the Chemers Faire. This 4 1/2 minute slideshow reveals the transformation from white wool and silk fabric to the beautifully rich, unique nuno felted garments made in the five day workshop. This workshop was so much fun and such a learning experience for all. 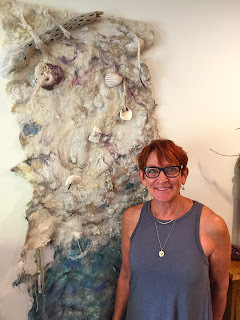 Thank you Glennis Dolce for teaching shibori and indigo dyeing, And thank you to all the awesome women who attended and made this workshop such a rewarding joy; it was a pleasure to instruct and share together. And a big shout out and thank you to the American Legion Post 295 - Cypress, California for hosting us. This was the piece I demonstrated in the workshop. It is a seamless nuno felted garment created with white merino wool roving and various types of white silk. In the workshop I ombre indigo dyed it from very light to medium blue after which I eco-printed the lighter part of the garment with eucalyptus leaves. 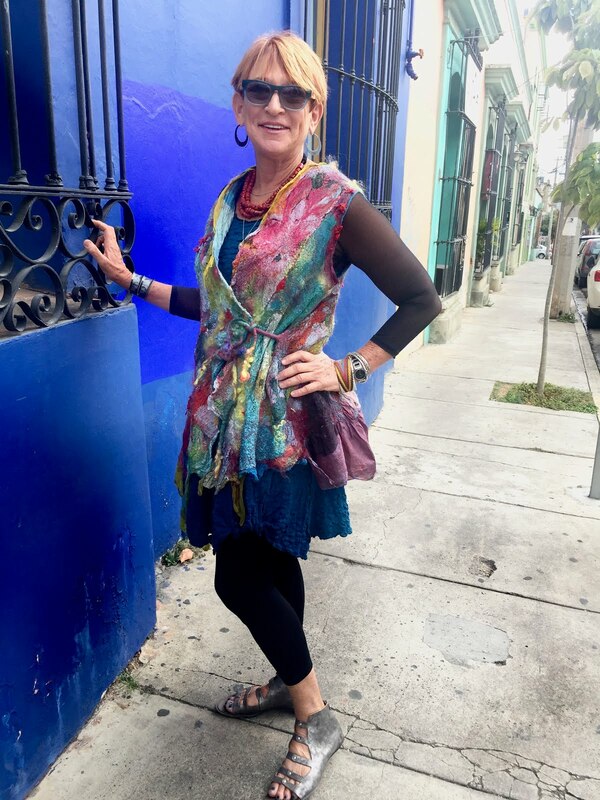 Here I am wearing it off the shoulder and below I'm wearing it tied with an eco-printed viscose infinity scarf, a long sleeve top that I indigo dyed in the workshop worn over the sleeveless linen top that I shibori stitched and indigo dyed (see it worn sleeveless further below). I shibori stitched and indigo dyed some tired, old white linen clothes. Now they have a new and exciting new life and will be proudly worn. 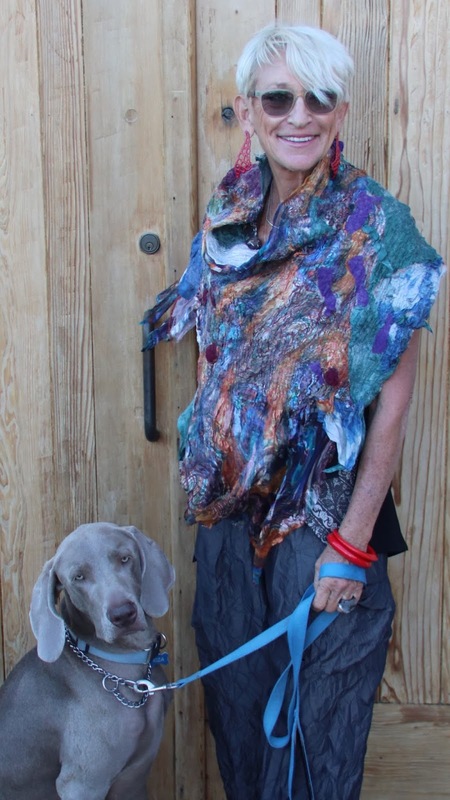 Students learned to make a sized up pattern to account for felting shrinkage, made a garment in white merino wool and silk fabric, learned eco-printing, shibori wrapping and indigo dyeing which was done not only on the felted garment but on yardage, existing clothing and more. Get outlines like this by using an iron blanket. I made the iron blanket by dipping paper towels in a diluted mixture of rusty items, water and vinegar. Thank you ladies for making the workshop so rewarding.